The Legend of Zelda: Breath of the Wild is, in the opinion of this scribe, one of the finest games ever made. The adventure can be tackled in a variety of ways, but the ending brings it all together in one intense showdown, which naturally has Legend of Zelda lore fans interpreting and discussing various implications. Now there's been chatter around potential differences in the ending between the Japanese text / dialogue and the English equivalent - let's break it down. Spoiler warning - this article is about the ending of the game, don't read on if you don't want to know more. Let's just break down the key quotes that people are talking about, first, before we get into whether there's actually any issue with the localisation or lore. The following is from legendsoflocalisation.com, bold emphasis added. This form was born from his obsessive refusal to give up on revival… He has given up on reincarnation and assumed his pure, enraged form. If set free upon the world, it would result in a tragedy surpassing the one 100 years ago. If set free upon our world, the destruction will be unlike anything ever seen before. The question of revival and resurrection is the key here, with the initial suggestion that the English version suggests a finality to Ganon in this battle, whereas the Japanese text suggests the usual 'Ganon will always be revived' narrative. Oddly, the table flips in a later scene. For starters, not all fully agree with the translations and, as a result, whether there's an issue here at all - the issue being that it's unclear whether it's a 'final' defeat of Ganon. Even taking the interpretations as they are you could argue there's not actually inconsistency here, just semantics - the second screen says the threat of 'Calamity Ganon' has passed, not just plain-old Ganon. Likewise "he has given up on reincarnation" from the English scene could just refer to that moment, in that he's given up in that battle. Perhaps some handy clarity comes from the article's comments section, via 'joeymartin64', below. So the “for now” WASN’T in the Japanese version! Interesting! It’s playing fast and loose with words like “revival” and “reincarnation” and even “regeneration”, but perhaps the English line could mean that he’s only given up on THAT SPECIFIC body/reincarnation/regeneration/etc., rather than the whole concept in general. That would actually harmonize it somewhat with the Japanese line; since Link has prevented the physical body we see from being completed, his desire to revive going out of control as a result of that could then be interpreted in a “you done pissed him off” kind of way. No idea what the Japanese version of the Hyrule Compendium says, though. It's all quite fun and interesting to debate, in any case. All told we're not convinced there's a big inconsistency in localisation here, but the fact it's being talked about reminds us of how passionate and engaged fans of the IP can be. By all means share your own theories in the comments! But it's not the end.......there's the DLC coming. I feel this may not be the end of Ganon itself, but rather just Calamity Ganon. After all Ganon was born from the pure hatred of Demise, and as long as zelda and link get reincarnated, so will Ganon. That is the curse put upon Link, forcing him to be reincarnated time and time again just for an endless battle with a wrathful God. I doubt Ganon will return in the DLC, but perhaps we may see him in the game's sequel. Or maybe they will pull a Majoras Mask and give Hyrule(Or whatever kingdom they will be in) a new threat for Link to face. And even if this was Ganons defeat, it wouldn't have been the true end to him. Remember Zelda has branching timelines, and this would have just been either the end of one, or just a timeline where Ganons gone for good. I don't think it's really worth reading too much meaning into the exact wording of the plot scenes and I think the fact that it's not even the same in all languages is just further evidence of that. Future Zelda games will disregard the minutiae of the previous story lines in favour of doing whatever works best for the current one. Meh. Not much difference... And it's not like the Zelda games are strongly connected by story that it'll be affected. Ganon will always come back. He symbolises power. It'll be interesting to see where the DLC will take us. God I love this game. I don't really see any problem, so long as we assume there is a difference between 'revival' and 'reincarnation'. I feel the already well established Ganon/Gannondorf split gives these two words very clear counterparts. Ganondorf is generally what you get when Ganon is born of flesh; it is the corporeal manifestation of his eternal spirit; is it Ganon 'incarnate'. Hence, Ganondorf being born as (for example) the son of Gerudo is a 'reincarnation'. In games like OoT, 'Ganon' is what emerges when you defeat his humanoid form; the spirit beneath the man. One main difference between OoT and BotW is that clearly Ganon is attempting to 'reincarnate' himself as something more ambitious than a ginger dude with a big sword (though his pupal form is still ginger and has a big sword). Another difference is that we encounter Ganon during the reincarnation process, rather than after it (by which time he is usually well-established as 'Ganondorf' - a name which doesn't appear in BotW). Even so, I believe it's still pretty much analogous. 'Revival' has happened some time ago in Breath (otherwise he wouldn't have been able to cause such destruction 100 years ago), but 'reincarnation' is ongoing, and a process you interrupt when initiating the final battle. As such, when you defeat his semi-reincarnated, crazy-pupal buggy-leggy-robot-spider-form and face up against the purest manifestation of his spirit, you are greeted with the line, "he has given up on reincarnation". This is purely situational. It doesn't mean "Ganon has forever given up on the idea of returning in non-spirit form". It just means, "the whole 'reincarnation' thing became a bit tricky when you strolled into his lair and repeatedly smacked him with a sword, so he's abandoned that and has reverted to his enraged spirit form instead (which is a pig lol)". To reiterate; the line "Ganon has given up on reincarnation" only applies during that very narrow window; to that particular version of Ganon at that particular time. If I say half way through a meal, "I give up on dinner - I ate way too much ice cream earlier so I'm full", people will accept that I simply don't want to finish that particular meal at that particular time. It's not that I've abandoned the concept of 'dinner' altogether. Anyway, sorry to witter on, but I don't think there are any inconsistencies, and what was meant by the given words can be easily surmised from context. Ganon was attempting 'reincarnation' (rebirth in physical form). Then you interrupted him, defeated him in his semi-incarnated state, so he naturally gave up on that and assumed his spirit form instead. You then defeated that and sealed it away (though presumably did not destroy it entirely). The end. Who knows what the future will hold, but that's a pretty solid summary of the events in Breath, and I'm my opinion each word (in both languages) justifies its place. The only difference is a result of people misunderstanding what was actually meant by the term 'reincarnation' in the English version... and even 'joeymartin64' clearly doesn't understand that the term has a substantially different meaning from revival/resurrection/regeneration. They are two different mechanics for a character returning from the dead. Revival/resurrection/regeneration involve the character returning as the same character, which is how Ganondorf/Ganon almost always returns (the only exception being in FSA, which is the only instance of him being reincarnated). Reincarnation involves the character being reborn as a different character (even though they may look similar or even have the same name)... this is how Link and Zelda(/Hylia) are able to return for every game, as well as how Demise was able to return as Ganondorf/Ganon (and possibly other antagonists in the franchise). Basically, by continuously being revived/resurrected, Ganon was preventing himself from being reincarnated. I feel like it's comparing black vs really dark gray, sure there is a difference but it's basically the same and probably not worth worrying about. English and Japanese aren’t the only languages that exist. You can actually compare the several other translations to see where this is going. I’ve played Zelda games in both French and English, French translations tend to be very close to the japanese (at the point of naming Midna Midona for example). It is a technicality - at the end of the day, Ganon will more than likely be back in some form regardless of the localization. That said, I would hazard a guess that if they decide to produce another Zelda this gen using the same engine that the villain won't be Ganon. If we see another stylistic or platform shift, we'll go back to Ganon. Wonder if in the next DLC you'll need to visit 6 palaces to unlock the triforce of courage in an effort to keep Ganon's minions from bleeding you dry to resurrect the pile of ashes that Ganon has become? @entisocial Most likely the usually French, Spanish, German and Italian translations are based on the English translations. So in this case, the French translation is most likely the same as the English translation (feel free to prove me wrong). Although there is nothing stopping from not sticking with the original (in cases like a joke or slang that only work in English). There are cases where this might not be the case like "Advance Wars: Dual Strike" where the translation isn't quite the same. Jake's over the top lines "What's up now Blackhole!?" and "Gonna serve you a bowl of smackdown soup!" don't appear in the French translation. He seems to speak more normally, like the Japanese version. As if I haven't said enough, it's also worth noting that from the perspective of the characters providing the narration in the game, they can only really comment on the version of Ganon they're faced with. If they say, "he has given up in reincarnation", it's pretty clear that they're talking about the thing right in front of them at that moment. They're not really qualified to comment on all future attempts of the spirit monster to come back into the world for the next bajillion years. Which is set in the past, right? We all know Ganon/Demise never dies. This time around he just decided to skip the theatrics of assuming a form and manipulating things behind the scenes and went pure beast mode. I think it's silly that they try to piece these games together and all. Nintendo trips over it's own lore all the time and doesn't particularly care that much about story to begin with. Your time would honestly be better spent watching paint dry than trying to get anything out of this. Depuis l’aube des temps, notre éternel ennemi...Il est la flamme du mal et de la haine. Maintes fois étouffée, toujours ravivée. Son incapacité à retrouver sa forme charnelle ne fait qu’attiser sa fureur destructrice. La menace de Ganon est levée, mais son passage a laissé des traces. Since the dawn of time, our eternal enemy ... He is the flame of evil and hatred. Many times stifled, always revived. His inability to recover his carnal form only fuels his destructive fury. The threat of Ganon is lifted, but its passage left traces. Which I think is different from the english one. For the bold text, the english translation suggests that Ganon doesn’t get a physical form on purpose, while the french one suggests that he’s unable to as a degenerate, and the japanese also suggests that this form is not the result of Ganon’s intention. 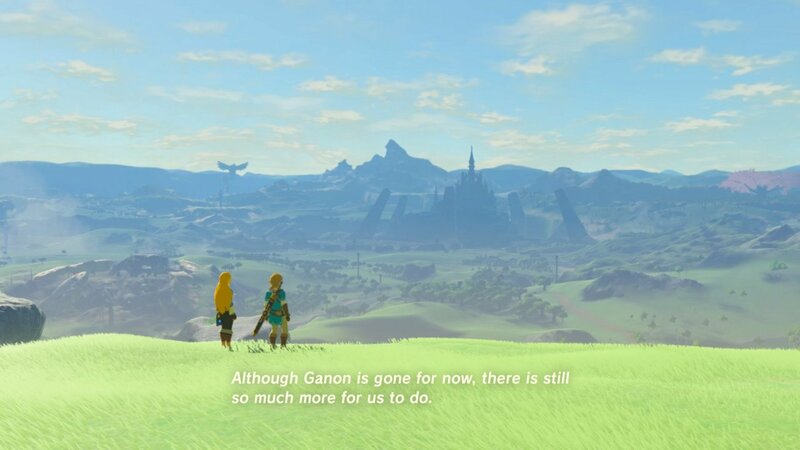 I absolutely loved BotW, but have to admit I found the ending and final battle to be extremely underwhelming. Did anyone else think the same? I've been aware of the original japanese text for this part of the game for several months now due to the hefty discussion topics over at the Zelda Universe forums. To put it all in a nutshell, the nuances between this and the official translation outline scenarios that are already relatively 'part of the norm' from what the series has shown "Ganon's" return (and/or emergence from Ganondorf) patterns to be. The 'reincarnation' tidbit is referring to a form that doesn't assume Ganon's bestial form, because the classification of a "transformed" Ganon is resultant from pure hatred and Ganon is intrinsically born from Ganondorf who is the "reincarnation." Take Twilight Princess for example, in the execution cutscene the Triforce of Power resonates within Ganondorf and we witness what appears to be somewhat of a diminutive transformation into Ganon. The sages described this as "his abiding hatred and lust for power turned to purest malice" which is a phenomenon that goes hand-in-hand with "He’s an embodiment of hatred and grudge that arose in distant antiquity and revives again and again no matter how many times he’s destroyed." The "revival" concurs with this to the extent that a.) Ganon is spawned from a DEFEATED Ganondorf (or in the case of Calamity Ganon a monstrosity that can extend its existence into "Ganon" after being defeated) and b.) that Ganon invariably resurrects/return throughout the course of history. @crackafreeze @SLIGEACH_EIRE it is very possible that in the dlc you don't fight any form of Gannon at all. Could be Vaati or a new threat we have never seen before. Lol: As long as the franchise continues, he will be there. There may be some games with other enemies in the meantime, but he will return. One thing we all must remember is that just because Ganon may be truly gone in Breath of the Wild, it does not mean he's gone in the other time lines. This is just the timeline that finally managed to expunge him completely, which given what Ganon has turned into in Breath of the Wild I think is appropriate. We can always go to another Zelda universe to fight Ganon again, but I also wouldn't mind moving forward with this time line and seeing what new possibilities there will be that have nothing to do with Ganon. Zelda games have done it successfully in the past, it can do it again. So next time there may be an even bigger Ganon, oh boy. I really hope that one day somehow he will be finished for good. Resurrection and Reincarnation are two completely different things, so the versions don't really differentiate from another. All 3 main characters of the Zelda franchise have different ways to reappear throughout the series. Ganon/dorf never changed. He's still the same person he was in OoT. He's either killed and revived, or sealed and freed. Zelda is always a descendant to the previous Princesses and related by blood. It's stated over and over again, that her powers run in her bloodline and are inherited. Link is never stated to be a descendant, in fact, there are times and times again where it's proven he's NOT related by blood to his previous versions. He reincarnates - same soul, different body. "My hate... never perishes. It is born anew in a cycle with no end! I will rise again! Those like you... Those who share the blood of the goddess and the spirit of the hero... They are eternally bound to this curse. An incarnation of my hatred shall ever follow your kind, dooming them to wander a blood-soaked sea of darkness for all time!" Not his mention of the Goddess's blood, the Hero's Spirit (/Soul) and that he only talks of "An incarnation" - meaning one. So, with Ganon's refuse to Reincarnate and his stubbornness to be revived, meaning to not become a different person, it's not that far fetched that after all those centuries all what's left of him is his pure anger and madness. @King_Johobo He can always come back, but maybe not in games that take place after BotW. It'll be interesting to see what happens. @Rutana Ganondorf has been killed entirely though – he was in Twilight Princess, and there's a second incarnation of Ganondorf in Four Swords Adventures. It's a separate individual, but whom still acquires the legacy of Demise after he claims the Trident (remarkably similar to the Ghirahim Sword of Demise) from the Pyramid in the Desert. Ganon may be gone for good again, but that doesn't mean the curse of demise is wholly wiped from the world, as seen with the destruction of Ganondorf in TP. It lingered in the Master Sword (as seen in the ending of SS – likely entering Ganondorf in OT's ToT sequence) and the Trident, and seems to have possessed men of the Gerudo lineage named Ganondorf. The Spirit of Demise could be lingering in other dark objects or forms not destroyed in BW. And there are other great demon too – Malladus, Bellum, Majora – so there's potential for great demons that aren't Ganon to show up still even if they don't go the route of Ganon's return beyond BW. I presume that the Calamity can't be resurrected with the blood of Link link in Zelda II, however. He'd have had to fully reform for that to happen. This ending is more like the destruction of Sauron. He hadn't fully taken his full power and form again when he was destroyed. @burchdude65 so true. Can't wait to see what happens in the future! I have never seen a so sh...y end boss battle in a zelda game. 🤤. I'm more concerned that when in the end Zelda says something about that she still need to speak to the Zora's king... I've went to Zora's Domain after the end, but haven't found anything when speaking to the king. That really bugged me way more than this translation difference. @marandahir You're right with Twilight Princess to Four Swords Adventures, here, Ganon (according to the Zelda Timeline) was actually reincarnated. And while you can debate long and for ever if the Four Sword games with their total lack of story should count, it's confirmed that way. But in every other game, Ganon is Revived, also proven by the Zelda Timeline. 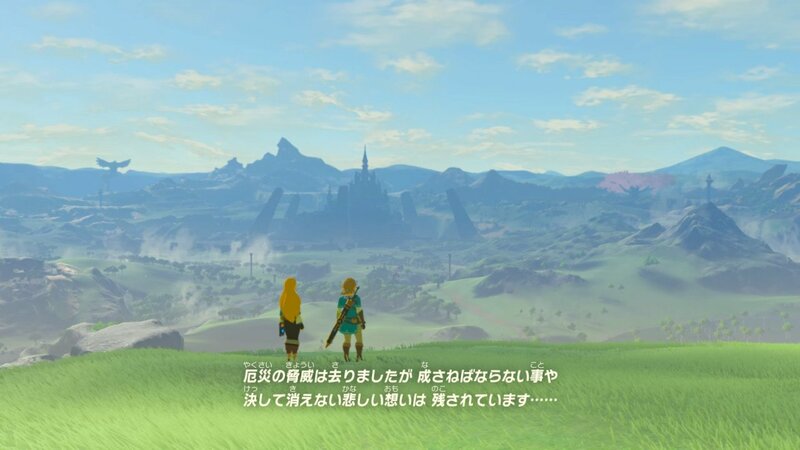 Plus, Breath of the Wild takes place in the Adult Timeline, not Child Timeline - so it's unconnected to Twilight Princess and Four Swords Adventures. Breath of the Wild further proves, that Calamity Ganon is a Ganon that doesn't want to reincarnate and instead sticks to Revival, just as the Decline Timeline's Ganon. Honestly I really wish they would just leave Ganon dead. Still use him in stuff like Smash Bros. and Hyrule Warriors, sure, but outside of Wind Waker he's consistently the least interesting Zelda villain and usually by a wide margin. Erm, when I finished the game, I read that line as "he was in the process of regenerating into his Ganon form, but you interrupted that and now he's given up on it," not, "He's given up on the endless cycle of regeneration forever," and I knew nothing about the Japanese text. People who read it to say that this is Ganon's final form and he has given up completely on ever being regenerated were reading way too much into the line. @Lizuka Don't hold your breath. @Maxz there's only ONE Ganondorf, that's always the same guy as in Ocarina of Time. And apart from, I think, Four Swords Adventures there's also only ONE Ganon. FSA has someone who's called Ganon II but I'm not sure where he came from because that's the one Zelda game I didn't play. Ganondorf never reincarnated or got revived. He never died in OoT. Wind Waker has a defeated Ganondorf who reflected on the mistakes he made when he tried to get the triforce, Twilight Princess' Ganondorf never was defeated which results in the cocky, manipulative lunatic who goes around killing people left and right and talking Zant into betraying Midna. The "third" version of the character is the Ganon in the games that were released before OoT (aka the downfall time line stuff) who got his hooves on the full triforce by killing the hero and kept the beast Form because magic. That third one got revived at one or two points in time, as did the one who was never defeated before his death in TP. Wind Waker Ganondorf's sitting pretty at the bottom of the Great Sea as statue. Edit: alright, wanted to make doubly sure for this final bit. The Calamity straight up doesn't "live" anymore. It's Demise's curse in its purest format, it only comes back to haunt whomever inherits the Hero's Spirit and the current reincarnation of Hylia because it has to in a sense. That's why Zelda is so hellbent on sealing Ganon and why they aren't just killing it. They can't. @Tsurii Ooooh man... wow! That's an awful lot I glossed over/just plain got wrong. Thanks for correcting me on (large chunks of) Zelda's lore. I suppose one idea I'll stick by is that at least Ganondorf is clearly an incarnation of Ganon's spirit in some form, even if he wasn't 'reincarnated' nearly as much as I thought. The physical/spiritual split was the main distinction I wanted to draw, because there's clearly a similar split between the final boss (robo-tarantula Ganon) and the FINAL final boss (spirit-boar Ganon). Edit: @WaxxyOne This is the only comment that needs to be said, really. I'm pretty sure it's 100% on point. @Rutana There's no confirmation that Breath of the Wild takes place specifically on the Adult Timeline. Its timeline placement is entirely up to the fans at this point. Most fans think it's either on the Child Timeline, actually, due to Zelda's comments about the Twilight, but I'd argue the other main theory, which is that it takes place sometime after all three timelines somehow recombine a-la "the Warp in the West" that happened during the finale of "The Elder Scrolls II: Daggerfall" (as recounted in the TES III-V in-game book, "Where Were You When the Dragon Broke?"). @Tsurii Ganondorf exists as a separate individual in FSA as well. A Gerudo Man named Ganondorf stole the Trident and the Dark Mirror from the Zuni Pyramid in the middle of the Desert of Doubt, and in doing so, became the Evil King of Darkness, Ganon. This is a separate Ganondorf from in Ocarina of Time, but he's definitely referred to as Ganondorf, though we never see him in that form (much like Ganon is referred to as having formerly been a mortal man and a leader of thieves by folks in A Link to the Past). The point is that the story isn't as simple as you'd like it to be. Ganondorf sometimes is revived, and sometimes is reincarnated, much like Link, much like Zelda – though Link and Zelda are much more likely to be reincarnated that revived. Interesting that Nintendo of America decided to translate reincarnation as revival in Breath of the Wild – they may not see a difference between the two. I wonder if the original writers see a different, too.